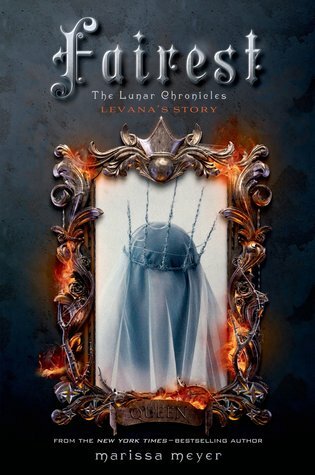 The Lunar Chronicles is one of the best YA series in recent years. It has everything you can ask for. A strong plot. Well-developed characters - particularly female characters whose stories are not solely centered around a boy. Fairy tale retellings. Sci fi elements that welcome unfamiliar readers into the genre. And so much more. Each of the Lunar Chronicles are linked companion novels. Fairest is kind of a companion to the companion novels. It tells the story of Queen Levana - the big bad and also links back to the three heroines of the series. Unlike the other books in the series, I don't think it's a fairy tale retelling (although I could be wrong about that). This book takes you into the head of the villain and helps you understand her. What I loved best about this book is that it didn't make me sympathize with Levana. It did make me understand her though. Levana has had a lot of bad things happen in her life. She has an evil sister who tried to kill her, she's horribly disfigured, she has an unrequited love that she doesn't know how to properly handle...basically Levana leads a very lonely life despite being surrounded by people. However, this books makes it clear that Levana's villainy is due to her choices and actions. she is not merely a victim. Levana reacts to stress and loneliness with greed, anger, and power grabs. She is incapable of empathy. She's not a sweet girl who falls into bad circumstances and accidentally does bad things. This book makes it clear that she's aware of her actions but either doesn't care or can't control her impulses enough to stop. Levana is not a one-dimensional villain though. Actually in some ways she is - she's almost completely bad. But thanks to this book, you understand what made her that way and it makes her villainous choices logical from her perspective. Ultimately it adds a lot more depth to the series from being able to see the universe through Levana's eyes. *Side note - technically this book is outside of the chronology of the series. However, I do think you shouldn't read it until after you've read the first three books. It touches on events from the books that will make a lot more sense if you've already read them. This one of the best novellas I read in quite some time. It serves a purpose and isn't just filler. I did feel a little bad for Levana but she is definitely a disturbing character. Can't wait for Winter to come out! I have tried to read this book and I enjoy this series but I didn't get very far.